Microsoft has finally released the Windows 10 Technical Preview and I took the bait and changed my laptop OS from Ubuntu to Windows 10 just because I wanted to have the fresh taste of Windows 10 experience. The iso setup is a little less than 4 GB and can be downloaded from the Microsoft site. Take a backup of your personal files on a separate storage device or on a cloud account. Backup your settings too with a recovery drive on USB. This recovery will erase all your data on the USB before making the recovery drive so be careful. There is no going back after you have installed Windows 10. To go back to your previous or any other version you need to install the OS fresh from a DVD or USB or any other bootable media. These precautions are important because the Technical Preview is not a software and its installation might cause corruption of your hard drive causing you to lose all your data. After that make a bootable DVD or USB with the Technical Preview installation ISO. You just need to burn a DVD from the ISO to make the bootable DVD and for USB you can find the steps to make a bootable USB for Windows 10. Now restart your PC, enter into the boot mode and follow some simple steps to upgrade to Technical Preview of Windows 10. These steps will only be selecting the partition to install the Windows on and then it will take over by itself. The PC will restart many times during the process and once it completes you will be greeted by a Windows 8 themed set up process where it will ask for your Microsoft account; whether or not your agree to some legal agreement and then sync your settings with any other Microsoft device you have. Once these steps are completed you are directly greeted by the familiar Windows login screen and after signing in, the Windows 10 desktop! Yes, you read it right. You don't have a Tiled homescreen here, rather the old but a little modified, Windows desktop. Before we proceed, if you too have installed with Windows 10 Technical Preview then make sure you have a mouse handy because like the old Windows versions, Windows 10 is not especially touch friendly like the Windows 8. If you have another Windows device then you might feel too familiar with the screen because the desktop might be the same like in my case I had the same Bing wallpapers that I had installed on my Windows 7 system. But wait, not all is the same here. In the Task Bar you have a search icon and a two tiled icon (Task View) which we are going to discuss about later. And yeah! How can we miss the all too familiar Start button! Click on it and you see two separate familiar things integrated into one. On clicking on the start button you have the familiar Windows 7 list view of various software and joined to it is the Windows 8 tiles screen. Note: On clicking the Start button you might get a Windows 8 Start Page depending on whether you have a touch based device or not. In a touch based you have a Start Page and in case of non-touch devices you have the Start Menu as shown in the image above. You can change if you want the Start page or the Start menu by doing Right click on the Task Bar > Properties > Start Menu > Checking or unchecking the option "Use the Start Menu instead of the Start Screen". If you do decide to change it then you will have the reboot the system for the effects to take place (Not sure why!). The Start Menu can be sort of a smartphone home screen for you containing the shortcuts to you frequently used software or apps. You can customize what it contains and also its size. You can customize its content it from the toolbar menu I mentioned above. The two new additions here are the Search bar and the All Apps options. The Search bar does not only searches your software or files on the local hard drive. Rather, it is now a universal search which will search your cloud accounts you have associated with Microsoft, Bing as well as your local drive. If you want to search for a contact you have saved in your Hotmail account then that too will be visible here. Clicking on All Apps will list all your apps in alphabetical order. These are not only the Windows 8 based full screen apps but also your other installed softwares. If you scroll down you will find some Windows folders there. Now, the question is why are there Live tiles on your Start Menu? Well, that is to keep you updated regarding any new mails, news or messages from your friends. These are dynamic tiles and you can move them around, resize them, unpin or even uninstall them from the Start Menu window. If you want to add more Live tiles then open the All Apps list and drag the app tile to the Live tile pane and switch Live Tile capability on/off. 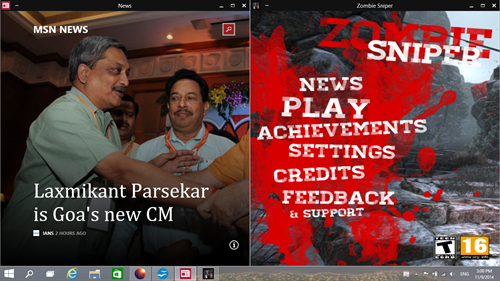 A cool feature in Windows 10 is the ability to snap multiple apps on your Windows screen. I don't think that it needs any explanation how useful this feature can be. Especially for professionals who multitask between 5-10 windows at a time, this feature can be a blessing. However, unlike for touch based devices where its use it optimized; in non-touch devices the feature does not seem to work properly as of now. In touch based devices when you take a window to the corner of the screen, it will snap in one quarter of the screen and if you snap it to left or right it will cover half the screen. However, in non-touch devices like my laptop, the apps don't snap and you have to manually resize them. Also, some apps don't seem to get small in their length after a particular size which less more than half the screen length. It means that your apps will overlap each other. You can sure adjust the working area to still get your task done but the feature needs to be worked upon. This can be a reason why Microsoft suggested to use Windows 10 on large screen monitor screens. This is a feature which takes multitasking to uber-high levels. It is a sort of multi monitor set up of your different apps. For example, you can create a Desktop with your personal apps or windows open in it and in another Desktop you can have your professional apps and windows. However, these virtual desktops are not disconnected. If you have a web browser open in one virtual desktop, then launching a link suppose from a search page or a shortcut from your other desktop will open a tab in the web browser already launched in your first Desktop. You can shift the apps launched in one desktop to another by clicking on the Task View icon and then right click on the app and click on Move to move it to another desktop. You can also navigate between the different desktops using the Alt + Windows + Left/Right key combination. Be sure to use the Windows Feedback app if you like any feature or you find some bugs or any other comments you have the Windows 10 Technical Preview OS. It is our comments which might bring improvements to the final release which is expected 9 months later. For instance I reported issues with the mail app. First, I was not able to add more accounts to it. I went to the Feedback app and saw the same issue already reported there. There seemed to be some small mail icon which can be used for managing the accounts. Second issue is the reason I have still not been able to add another email account. I opened a mail in a New Windows and then closed it using the cross button. Now, instead of taking back to the mail app it closed the entire app. Now, when I open the Mail app again all I get is a black screen with the mail subject line still written on the Window top. It means that it is still opening the app from my previous session. Update: The Mail app is working now but I am not able to find the option to add another email account even now! I am sure with more use I am going to find many more issues with this Windows 10 Technical Preview. So again, if you want a stable system to work with and have important tasks to accomplish for which you are dependent on only 1 system then I don't recommend installing this beta version. This release it only for the tech addicts you don't mind playing with a few bugs and know how to format and find workarounds for bugs that can even halt any activity on the systems. So, keep following my posts on TEC for many more updates about the Windows 10 Technical Preview as well as the actual release! Read how to install Windows 10 on VMWare Workstation. Thanks to the author for sharing a real-life experience of downloading the Windows 10 Technical Preview and checking out it's features first hand. I have not downloaded the same, but after reading your complete review of Windows 10 features, my curiosity levels have increased. I liked the Start Menu option that Microsoft has provided and also the fact that you can switch from Start screen to Start Menu by a simple tick. The feature to snap apps to 4 corners of Windows 10 is really good indeed. Also, it is a pleasant surprise that Microsoft has brought about a change even with regards to Windows 10 bug reporting using Windows Feedback app. Windows too late in the virtual desktops and Windows snapping window management. Linux has been doing this for a long time. You are quite right. Linux had this functionality since a long time. However, better late than never! Windows has finally included this functionality and that is quite appreciable.